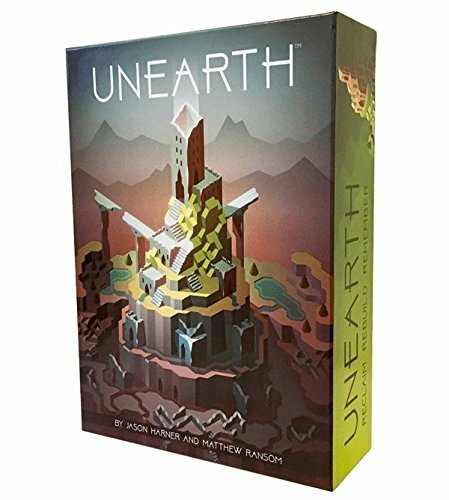 The second game from Brotherwise Games, Unearth is a game of cards, tokens and dice. This game is based on the premise that in the distant past, your faction’s ancestors once had great cities throughout the world. The world has moved on and all cities have ended in ruin, your current faction of people known as Delvers are explorers and scavengers looking to reclaim lost ruins and wonders of the ancient people. There are 5 colors of ruins (white, black, red, green, blue) indicating the environment that the ruins were found in, and there are several different types of wonders including lesser wonders, greater wonders and named wonders. Lesser and Greater wonders are represented only by hex tiles, named wonders have an associated matching hex time and named wonder card. In Unearth cards come in 3 different varieties, Delver cards, Wonder cards and Ruin cards / Event cards. Finally there are colored hex tokens black, blue, red and yellow which are tied to the various wonders. This game takes about 1 hour to play for 4 people and around 30 – 45 minutes for less than 4 people depending on how fast people make decisions, rolls and move through the turns. To setup Unearth you assign a dice color set to each player, yellow, green, blue and red are the 4 color sets of dice, each set consists of a d8, 3 d6, and a d4. In a 4 player game, you shuffle the ruins, put 5 away in the box and then shuffle the 5 end of age cards. You pick 1 end of age card and place it at the bottom of the ruins deck. You then deal 1 ruin to each player as mentioned above then you place 5 ruins face up on the table in the center and draw random color hex tokens placing them on the ruins based on the number on the bottom right of each ruin card (2-3) is the only option for number of hex tokens on a ruin. Next you shuffle the delver cards and deal 2 delver cards to each player. Next you shuffle the named wonder cards and place 6 named wonder cards on the table face up above the 5 ruins cards. You also find and place the matching hex token for each wonder card. Next you find and place the lesser wonders card and greater wonders card on the table and stack the lesser and greater wonders hex tokens on the appropriate cards. Last you shuffle the bag of colored “stones” which are the hex token gems. Each player rolls the d8 and highest number goes first, with play going clockwise after winner is chosen. The game consists of two phases and each player progresses through both phases on their turn. In this phase you review and play one delver card from your hand, this delver card goes into effect immediately and can alter dice already placed on a ruin, or affect the dice you are about to roll on your next phase the excavation phase. On any phase if you are able to built a wonder you can build that wonder, because some delver cards allow you to modify die rolls and get stones and ruins on the delver phase before your excavation phase. The excavation phase you choose which ruin you want to unearth and roll a die placing it on that ruin. At the top left of every ruin is the number needed to fully unearth that ruin. The highest number on the die claims the ruin when that top left number is reached, and in the case of a tie the highest sided die wins. Like if you have a 6 on a d6 and a 6 on a d8 on the same ruin, the 6 on the d8 wins because the die is higher. If multiple dice are on the ruin the tie moves down the the line and if there is no clear winner, the ruin is lost and returned to the box instead of being claimed. When a ruin is claimed, the players who didn’t win the ruin get a delver card for each die they had on the ruin, and a new ruin is placed on the spot with the random hex tiles added to it. Finally if at any time you roll a 1, 2, or 3 on any ruin or have your dice changed to 1, 2 or 3 because of a delver card or wonder effect you get a stone off of the ruin of your choice. If there are no active stones on the ruin you still get to draw a random stone from the bag, you always get a stone if you roll a 1, 2 or 3. You arrange the stones in a hexagon pattern leaving the center blank on your side of the table, when you complete hexagon pattern you can place a lesser, greater or named wonder in the center. Greater wonders require you have all 6 stones of the same exact color, named wonders have specific patterns you have to match and lesser wonders only require 6 stones of any color. Each wonder is worth a certain amount of points as are claiming ruins, and the more ruins you claim that are the same color gets you bonus points. From playing the game 5 times with my family the most likely strategy to win is to build enough greater wonders or combination of greater wonders and named wonders to get as many points as possible. Lesser wonders only offer between 2 – 4 points and are helpers but not a viable strategy to really win the game. In all our games played the winner was the player who was able to collect the most ruins that matched the same color (5 blue ruins…etc) as you get a serious boost in points for each matching color ruin. So to avoid losing your strategy should be to undermine other players who appear to be going for the same color ruins, while trying to rack up your own ruins of the same color. Usually the easiest way is to get ruins that match your starting ruin color, but sometimes your starting ruin color is not one of the active ruins on the board so you have to adapt on the fly. This game is easy to learn, gets faster the more you play it though can be repetitive after the first few times as there are only 5 unique end of age cards, and the same named wonder cards end up getting used again, you get enough unique variation for 2-3 games but overall it is a fantastic game and easy to learn and play with beautiful artwork.